Question: Why do the inhabitants of cold climates eat fat? How would you find experimentally the relative quantities of heat given off when equal weights of sulphur, phosphorus, and carbon are thoroughly burned? Answer: An inhabitant of cold climates (called Frigid Zoans) eats fat principally because he can't get no lean, also because he wants to rise is temperature. But if equal weights of sulphur phosphorus and carbon are burned in his neighbourhood he will give off eating quite so much. The relative quantities of eat given off will depend upon how much sulphur etc. is burnt and how near it is burned to him. If I knew these facts it would be an easy sum to find the answer. SIR TOBY: Does not our lives consist of the four elements? SIR ANDREW: Faith, so they say; but I think it rather consists of eating and drinking. SIR TOBY: Thou'rt a scholar; let us therefore eat and drink. Twelfth Night (1601), II, iii. 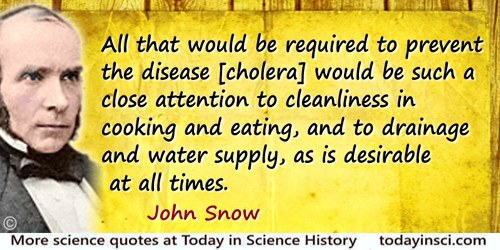 All that would be required to prevent the disease [cholera] would be such a close attention to cleanliness in cooking and eating, and to drainage and water supply, as is desirable at all times. In 'On the Mode of Communication of Cholera', The Edinburgh Medical Journal (Jan 1856), Vol. 1, No. 7, 670. Or the Gout will seize you and plague you both. In Poor Richard's Almanack (1734). Cheese and salt meat, should be sparingly eat. In Poor Richard’s Almanack (1733). Eating the Honey of Words. Title for book of his poems. Eating too much kills more quickly than eating too little. Aphorism as given by the fictional character Dezhnev Senior, in Fantastic Voyage II: Destination Brain (1987), 293. Even when all is known, the care of a man is not yet complete, because eating alone will not keep a man well; he must also take exercise. For food and exercise, while possessing opposite qualities, yet work together to produce health. Regimen, in Hippocrates, trans. W. H. S. Jones (1931), Vol. 4, 229. Geology is part of that remarkable dynamic process of the human mind which is generally called science and to which man is driven by an inquisitive urge. By noticing relationships in the results of his observations, he attempts to order and to explain the infinite variety of phenomena that at first sight may appear to be chaotic. In the history of civilization this type of progressive scientist has been characterized by Prometheus stealing the heavenly fire, by Adam eating from the tree of knowledge, by the Faustian ache for wisdom. In 'The Scientific Character of Geology', The Journal of Geology (Jul 1961), 69, No. 4, 454. He who plants a Walnut-Tree, expects not to eat of the fruit. No. 2401 in Gnomologia: Adagies and Proverbs, Wise Sentences and Witty Sayings (1732), 99. 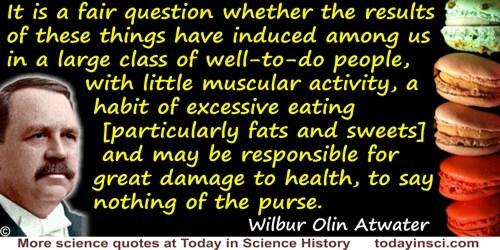 It is a fair question whether the results of these things have induced among us in a large class of well-to-do people, with little muscular activity, a habit of excessive eating [particularly fats and sweets] and may be responsible for great damage to health, to say nothing of the purse. L.A. Maynard citing Wilbur O. Atwater in a biographical sketch, Journal of Nutrition (1962) 78, 3. Quoted in Ira Wolinsky, Nutrition in Exercise and Sport (1998), 36. Man is an eating animal, a drinking animal, and a sleeping animal, and one placed in a material world, which alone furnishes all the human animal can desire. He is gifted besides with knowing faculties, practically to explore and to apply the resources of this world to his use. These are realities. All else is nothing; conscience and sentiment are mere figments of the imagination. Man has but five gates of knowledge, the five senses; he can know nothing but through them; all else is a vain fancy, and as for the being of a God, the existence of a soul, or a world to come, who can know anything about them? Depend upon it, my dear madam, these are only the bugbears by which men of sense govern fools. 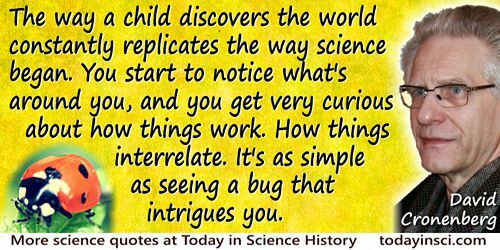 Attributed to Darwin by Mary Anne Schimmelpennick. Quoted in Christiana C. Hankin (ed.) Life of Mary Anne Schimmelpenninck (1858), Vol. I, 241-2. Our ability to think is the one survival tool we have. Science is applied thought. 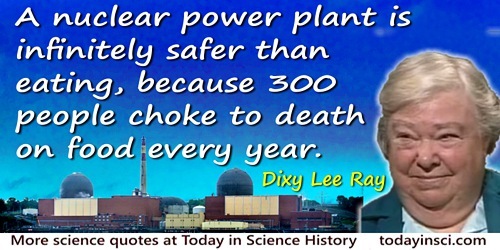 Without science, we’re living in caves and eating cockroaches. Sarcophagus is a stone that devours dead bodies, for in Greek σάρκος means “flesh” and φαγώ “eating”. Some of the ancients first made coffins for the dead of this stone because in the space of thirty days it consumed the dead… . For this reason stone monuments are called sarcophagi. From De Mineralibus (c.1261-1263), as translated by Dorothy Wyckoff, Book of Minerals (1967), 116. 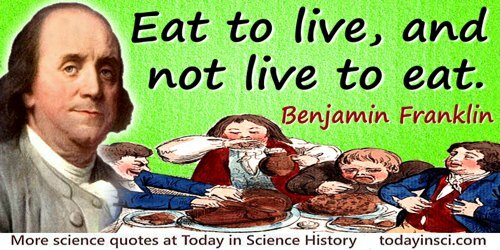 The chief pleasure [in eating] does not consist in costly seasoning, or exquisite flavor, but in yourself. In Maturin Murray Ballou (ed.) Treasury of Thought: Forming an Encyclopædia of Quotations from Ancient and Modern Authors (1871), 125. There was a golden period that I look back upon with great regret, in which the cheapest of experimental animals were medical students. Graduate students were even better. In the old days, if you offered a graduate student a thiamine-deficient diet, he gladly went on it, for that was the only way he could eat. Science is getting to be more and more difficult. These turdy-facy-nasty-paty-lousy-fartical rogues, with one poor groat's worth of unprepared antimony, finely wrapt up in several scartoccios, are able, very well, to kill their twenty a week, and play; yet, these meagre, started spirits, who have half stopt the organs of their minds with earthy oppilations, want not their favorers among your shrivell’d sallad-eating artizans, who are overjoyed that they may have their half-pe’rth of physic; though it purge them into another world, it makes no matter. Spoken by character Volpone, disguised as a “mountebank Doctor” in Valpone: or, The Foxe (1605), collected in Ben Jonson and William Gifford, The Works of Ben Johnson (1879), 282. This discovery, indeed, is almost of that kind which I call serendipity, a very expressive word, which as I have nothing better to tell you, I shall endeavour to explain to you: you will understand it better by the derivation than by the definition. I once read a silly fairy tale, called The Three Princes of Serendip: as their highnesses travelled, they were always making discoveries, by accidents and sagacity, of things which they were not in quest of: for instance, one of them discovered that a mule blind of the right eye had travelled the same road lately, because the grass was eaten only on the left side, where it was worse than on the right—now do you understand serendipity? Letter to Sir Horace Mann (28 Jan 1754), in W. S. Lewis, Warren Hunting Smith and George L. Lam (eds. ), Horace Walpole's Correspondence with Sir Horace Mann (1960), Vol. 20, 407-408. When you think about flying, it’s nuts really. Here you are at about 40,000 feet, screaming along at 700 miles an hour and you’re sitting there drinking Diet Pepsi and eating peanuts. It just doesn’t make any sense. [A vitamin is] a substance you get sick from if you don't eat it. In Ralph W. Moss, Free Radical (1988), 78. [For] those suffering under the thraldom of the vice [of opium eating] … it is well to avoid undue harshness with the patient; and it should be carefully remembered, that in many instances the sufferers are more objects of pity than of blame. [In] death at least there would be one profit; it would no longer be necessary to eat, to drink, to pay taxes, or to [offend] others; and as a man lies in his grave not one year, but hundreds and thousands of years, the profit was enormous. The life of man was, in short, a loss, and only his death a profit. In short story, Rothschild’s Fiddle (1894). Collected in The Black Monk and Other Stories (1915), 138.